The centerpiece of the British effort in 1777 was the plan of Major General John Burgoyne, who urged dividing the rebellious colonies by force at the Hudson River. He sought and received the endorsement of Lord George Germain, the chief strategist in London, as well as the blessing of George III, who specifically ordered the use of Indians and mercenaries to subdue the rebels — a testimony to the complete alienation between monarch and colonist. A British advance south from Canada. 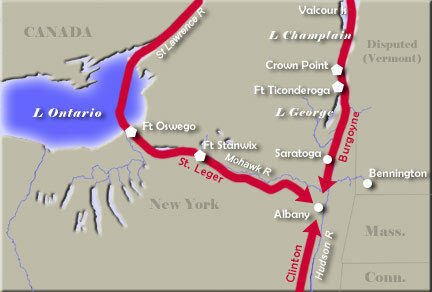 A considerable British force remained along the St. Lawrence, left over from a successful defense against the American invasion of 1775-76. Burgoyne was to lead an army from St. John’s, up Lake Champlain and eventually across to the upper Hudson and down to Albany, where he was to rendezvous with British forces coming from the Mohawk Valley and New York City. A British advance north from New York City. William Howe was initially slated to lead his army up the Hudson to Albany, but his preoccupation with taking Philadelphia left the task to Sir Henry Clinton. Howe believed that a quick campaign could be completed in Pennsylvania and return to New York in time to assist in the Hudson offensive. A drive toward Albany via the Mohawk Valley. Colonel Barry St. Leger was to lead his force eastward along the Mohawk River to capture the strategically important Fort Stanwix and, it was hoped, draw American troops from activities along the Hudson.